Another full block surface parking lot is about to disappear in Downtown Minneapolis thanks to Thrivent Financial. Tuesday evening the non-profit company made public the plans for their new headquarters that would be located at the corner of S 6th Street and 5th Avenue S on the northern half of the block. Now, don't fret because you think only half of the lot is getting filled, there's plans for the other half that we'll get to later. The new 8 story headquarters would not simply be JUST a headquarters for Thrivent, it would also be a space for the community. Included in the project on the first floor would be a coffee shop, chapel, and an art gallery with the upper floors holding Thrivent's offices. Outside of the building on the corner of Portland Avenue and S 6th Street would be a pocket park complete with public art. Located just a bit south of the pocket park would be a coffee shop and also a grab-and-go cafe, both which would be open to the public. With Thrivant being a non-profit company, they like to give back to community and do so in many different ways. They see this new headquarters as another way to give back to the community of Minneapolis. Once constructed they hope that the new building will be seen as an welcoming and iconic entry way into Downtown Minneapolis and a place for all to enjoy. Designed by Minnesota based HGA, the building is meant to really embrace the neighborhood. Large amounts of expansive glass are used to provide a transparent space connecting the interior of the building to the outside surrounding neighborhood. As mentioned above, the first floor of the project would include a chapel along with a meditation room, both of which are currently found within Thrivent's 17 story headquarters a block away. In addition, there would be a company art gallery. Located on the skyway level would be a full service Thrivent Federal Credit Union that would be open to the public, similar to how Wells Fargo structured their new headquarters. The skyway would connect the Thrivent's headquarters to a planned mixed-use development on the southern half of the site along with HCMC on the east side of the site. In the future, Thrivent's headquarters would link to the greater Downtown skyway system as projects are built on the neighboring blocks. Now, what exactly is planned for the southern half of the site that we keep mentioning? Local developer Sherman Associates has drafted up plans for a 12 story, 150 unit apartment building to be located along 5th Avenue S. In addition, on the Portland Avenue side of the site there would be a 9 story, 120 room suite-oriented hotel. The exact brand of hotel has yet to be disclosed as Sherman Associates is still in the negotiation process. Lastly, positioned between these two projects would be a two story building with a day care and fitness center, both of which are sure to prove popular with the downtown crowd. When looking at both Thrivent Headquarters and the Sherman development as one piece you might have noticed something, Minneapolis is going to see ANOTHER entire block of surface parking redeveloped. Does this remind anyone of maybe a currently under construction project just down the block? If you're thinking of the redevelopment of the Kraus Anderson headquarters then you're spot on. That project, which is in its final stages, saw the redevelopment of not only the KA headquarters building, but also the entire surface parking lot surrounding it which ended up being an ENTIRE city block. Today, if you drive by you'll find the brand new 5 story Kraus Anderson headquarters, a 17 residential building called HQ that opened this month, a 4 story Finnegan's brewery that is set to open later this month, and lastly, an under construction, 8 story, 165 room boutique hotel that will be part of Marriott's Autograph Collection called Elliot Park Hotel. If you haven't seen this project recently, check out the webcam here. Comparing that development to Thrivent's development we get pretty similar projects. Both include the redevelopment of a surface parking lot, the addition of a headquarters, a hotel, and a residential building. The only major difference? Instead of a brewery like the KA project, we'll get a fitness center and day care. Now, this is some progressive development that we're glad to see happening in Minneapolis. Let's keep it going, there's a lot of surface parking lots left to be conquered. Construction is expected to begin in Summer 2018 with a completion in mid 2020. CONSTRUCTION TO BEGIN ON "THE ELLIOT PARK HOTEL"
Construction will begin this month on a new 8 story, 168 room hotel in Downtown Minneapolis. The Elliot Park Hotel, will be part of Kraus Anderson's new mixed-used development located between S 8th Street and 9th Street along Fifth Avenue S. The redevelopment of the former Kraus Anderson headquarters includes a new five story headquarters for Kraus Anderson along with a 17 story residential building called "H.Q." and a 4 story Finnegan's Micro-Brewery. The Autograph Collection, a group of independently owned and operated high profile hotels under the Marriott flag, was created in 2010 and includes 102 different hotel properties around the world. One of those properties being The Hotel Minneapolis, which opened in 2008 and includes 222 rooms. While the exact images on what The Elliot Park Hotel will look like inside have yet to be released, we do know a few details. The hotel will be uniquely designed and will be constructed with high end materials that reflect the surrounding community. The hotel will include a fireside lounge along with a library, event space, meeting rooms, and of course a fitness center for those health buffs who don't want to slack while on a business trip or vacation. The exterior of the building will be wrapped in brick and include large windows along with a largely transparent first floor. The main entrance will be located off of 5th Avenue S while there will be an additional drop off location in the courtyard connecting the hotel to the brewery. On the ground floor of the hotel will be a restaurant called "Tavola" which will specialize in farm-to-table Italian cuisine. There also will be a private dining room located within the restaurant for special events and dinners. Coury Hospitality will operate The Elliott Park Hotel. "Their hotel portfolio includes four Ambassador Hotels under the Autograph Hotel Collection and one independently branded hotel." The company also has five additional Autograph Collection hotels either planned or under construction. Construction is expected to be complete in Summer 2018 with the opening of The Elliott Park Hotel occurring in late Summer 2018. A brand new Hilton hotel brand will call Minneapolis' East Town neighborhood home come 2018. Sherman Associates announced last week that a Canopy by Hilton will be the hotel that opens in Thresher Square once a top to bottom renovation and restoration is completed. The hotel will span all seven floors and will feature 182 guest rooms along with a ground floor restaurant and bar that focuses on farm to table food. It's big news for Sherman Associate's latest project as the Thresher Square Canopy by Hilton will be the first location for the brand within the Midwest. Once open the hotel will be the 7th Hilton property in Downtown Minneapolis and the 9th property within Minneapolis. While the historic Thresher Square building is being renovated, Sherman Associates is also constructing a seven story mixed-use building next door called "East End". That building will be home to 180 market-rate apartments along with ground floor retail. Trader Joe's will call most of that ground floor home while Jimmy John's will open a location in a retail space at the back of the building. A new customer is here; The Millennials. The hospitality industry is changing at a rapid pace as hotel brands race to re-brand themselves and appeal to a new industry and customer. Whether that be the rebranding of well established brands such as Hilton's Embassy Suites or the creation of entirely new hotel concepts such as Hilton's Canopy by Hilton, the hotel industry is taking notice and responding quickly. Canopy by Hilton bills itself as an "energizing new hotel in the neighborhood." Their boutique styled hotels are filled with extras and surprises. Upon arrival guests are given a "Welcome Treat" which often is a local sweet of some type. Check-in is available in person at a desk or also on your mobile phone. The lobby is designed for lingering, wandering, and meeting new friends. Breakfast in on the hotel, whether that be in your room or in their cafe. Same with basic wi-fi, it's all free. Guests also can come down to the lobby each night for a sampling of the areas best beers, wines, and spirits complimentary of the hotel. The guest rooms feature a split room design with a sliding barn door separating the spaces. The over all design is a new take on modern/traditional with eclectic pieces of furniture such as lounge chairs, side tables and desks along with of course a luxurious bed. Take a look for yourself here. While exploring the hotel further guests will notice the attention to detail, more importantly the attention to local details. Canopy by Hilton properties take design cues from the surrounding neighborhoods. The Downtown Minneapolis location for instance will highlight the local Mill District vibe with an industrial chic look. Canopy by Hilton plans to open in Minneapolis in January 2018 before US Bank Stadium hosts the Super Bowl. A well known home retailer is planning to enter the boutique hotel market with one of their first properties being planned for Minneapolis' North Loop neighborhood. West Elm, a company that is part of the William Sonoma and Pottery Barn family, opened its first retail store in New York City's Dumbo neighborhood in 2003. Since then the company has expanded to include over 100 locations across the United States and Canada including one right here in Edina, MN. Last week the Wall Street Journal reported that West Elm was venturing into a new area of business, the hospitality industry. The company isn't going to provide just the linens for hotel brands, rather they're creating an entirely new brand of boutique hotels. It makes sense when you think about it. Why wouldn't a retailer that provides everything for the home enter the hotel business? That's what West Elm is looking to capitalize on. The company will be able to provide everything from the sheets on the bed to the nightstand and the glass that contains water sitting on top. West Elm will also be able to use their vendor relations in order to provide nicer furnishings for their guest rooms at significantly reduced rate on their end. Guests who choose to stay at a West Elm Hotel will be able to purchase any of the items within their hotels room. And when we say any of the items, we literally mean ANYTHING. Upon check-in guests will be prompted to download an app that will reveal more information about the furnishings within their room, even allowing guests to order furnishings at any point during or after their stay. West Elm has been perfecting what will ultimately end up as their boutique hotels. In a Brooklyn warehouse they have been assembling mock hotel rooms, testing what works and what doesn't work in order to create a one of a kind boutique hotel. Their new boutique hotels will be designed depending on their location, the same way West Elm retail stores are. That means each one will be different and unique, something that is a drawing factor to those business and leisurely travelers looking for something different than just the repetitive standard hotel chain. Dimly lit hallways will grace West Elm hotels, a design feature that they've found encourages hotel guests to soften their voices and move about quietly in common spaces. 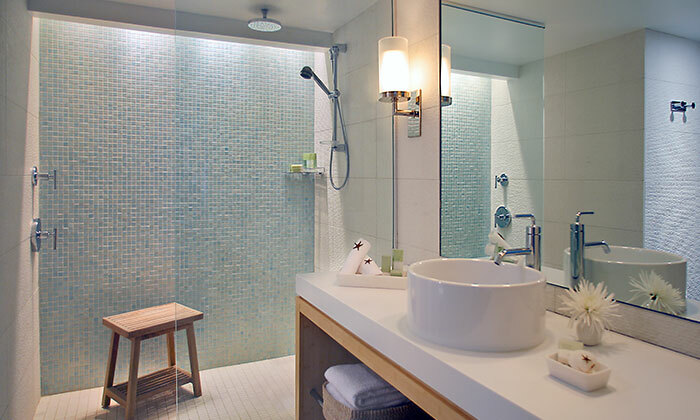 Custom designed marine blue tiles will adorn the bathrooms, marble coffee tables will provide a space for your morning cup of coffee, and 280 thread count sheets will keep you warm and provide a good nights sleep. In late 2018 the first West Elm Hotels will open in Detroit and Savannah. Following those first two initial openings three more hotels will open in Charlotte, Indianapolis, and right here in Minneapolis' North Loop neighborhood. Details regarding where exactly West Elm will locate their hotel in the North Loop have yet to be revealed. The size of the hotel is expected to be between 100-250 rooms with room rates raning from $175 to $400 a night. Plans for a hotel in the Uptown neighborhood recently were changed due to neighborhood opposition. We wrote a few weeks ago about a new hotel proposed for the Uptown neighborhood. The developer, Graves Hospitality, planned to bring a 9 story hotel with 144 rooms to a busy intersection. The hotel was to be under the MOXY brand, a new hotel chain aimed at millennials developed by Marriott (to learn more about the hotel read our previous post here). This week the developers came back to the city with new plans for a shorter hotel on the corner of Lake and Emerson. Scaled down by three stories, the proposed hotel now stands at 6 stories at the front and five stories or 58 feet at the back. With the reduction in height came a reduction in number of hotel rooms down from 140 to 123. As far as the rest of the details for the project they've remained the same. A restaurant is still planned for the ground floor and the hotel is still expected to fall under the Moxy brand, making it one of the first in the country. We'll have more information regarding this project once it heads to the Minneapolis Planning Commission meeting on February 8th. Uptown, meet Moxy. Your long awaited hotel. Uptown may soon get the hotel that many have hoped and wished for for many years now, that's if Graves Hospitality wish to bring a new Marriott branded hotel called Moxy is granted by the city of Minneapolis. Planned for 1121 West Lake Street, the new Moxy hotel would stand 9 stories tall and feature a ground floor restaurant/bar along 144 guest rooms on floors 2-9. The ground floor restaurant would be managed by Minneapolis based Graves Hospitality. A fun fact about this project is that it would be the FIRST Moxy hotel to open in the United States. Moxy most likely is a hotel chain you have yet to hear of and there's a good reason; it's less than a year old. The hotel brand was developed by Marriott and currently only has ONE open location in the entire world. That location won't remain the only child for long as 50 more hotels are in the pipeline for the Moxy brand expected to bring over 10,000 new hotel rooms to Marriott's portfolio. Moxy hotels are planned for high profile metropolitan areas across the country such as New York City, San Francisco, Seattle and Chicago and also in European countries such as Germany and the United Kingdom. Moxy is mean't to be a new style of hotel. Described by Marriott as an affordable luxury hotel chain that falls under the 3-star-tier segment, it's aimed at the millennial traveler "who understands that style can be delivered at attractive prices." The hotels feature innovative technology and style that are sure to attract younger generations while offering prices that are lower than comparable hotel brands. Hotels feature vibrant lobby areas that offer 24-hour cafe/bars along with seating areas equipped with all the technological needs one could desire. The planned Moxy hotel for Uptown's Lake Street will go before the Minneapolis Planning Commission this Thursday, November 19th, in order to seek a height variance (4 stories or 56 feet is currently allowed on site) along with feedback on massing and a request for C3A zoning. We'll have more details regarding the project as they become available. The proposals are in... meaning it is time to report. The city of Minneapolis has officially closed the option for developers to submit their plans for the development of 800 Washington Avenue. The site is owned by the city of Minneapolis and sits directly next to The American Academy of Neurology and the Aloft Hotel. Three developers stepped forward with each submitting plans for a hotel development. We would love you input on what design you think is the best being this is a competition afterall. At the bottom of this article is a poll in which you can submit your input. Mortenson Construction has submitted plans for a nine story structure that would feature a 188-room Hyatt Centric hotel. The building would include a restaurant on the ground floor along with additional retail space, hotel rooms on floors two through eight, and what appears to be banquet space / office space on the ninth level. The building would also have outdoor patio space on multiple levels. Within the project there will be about 15,000 square feet of office space that would be used by the The American Academy of Neurology. Currently the professional society has their 63,000 square foot, $20 million (absolutely stunning) headquarters next door which opened in 2012. There is another option for an an additional 15,000 square feet of office or banquet space within the building that the The American Academy of Neurology would be able use if the need arises. ESG Architects is the designer behind the Mortenson Construction development. They currently are probably one of the most prominent architectural firms within Minneapolis area regarding new construction projects. We guarantee you probably driven past at least two of their projects within the last day. The restaurant component would be spearhead by a Dallas company called Culinare. They're no strangers to the area, let alone the neighborhood, as they are responsible for Sea Change, the restaurant at the neighboring Guthrie Theater. Shea Inc would be responsible for the design of the restaurant. Marcus Hotels and Resorts would operate the Hyatt Centric hotel. The brand has yet to enter the Minnesota market as it is less than a year old. The company recently opened two locations in April, one in The Loop in Chicago and also one in South Beach Miami. 15 additional locations will open this summer in cities such as New York, Paris, and Atlanta. Hyatt Centric was created in order to appeal to the Modern Explorers of the world and is meant to be truly be more than just a hotel. "At Hyatt Centric, you'll find everything that you you need as you prepare for a business meeting, take in the local sites, or take advantage of a last-minute long weekend" their website says. Visit their website here in order to learn more about this exciting hotel concept. As we discussed earlier in the week Sherman Associates is also proposing a nine story hotel that would feature 140 rooms. While Sherman Associates has yet to divuldge full details regarding the project it can be seen from their latest rendering that the project would take on a very modern design approach. A 25,000 square foot, two level, Pinstripes is proposed for the building and would be located on the ground and second floor. Pinstripes is a entertainment venue that features a bistro with Italian/American food, a bowling alley, bocce ball, and of course a bar. Kimpton Hotels is the hospitality partner that Sherman Associates is working with for the project. Currently there is only a single Kimpton Hotel in the state and that is The Grand Hotel on Second Street in Downtown Minneapolis. Years back a Kimpton Hotel was floated for the Mall of America however we all know that that project ended up being the Radisson Blu. Kimpton Hotels was established back in 1981 by Bill Kimpton. Today it is the largest chain of boutique hotels in the United States. While many of the company's hotel are independently branded there are also two "branded" chain hotels called the Hotel Monaco and the Hotel Palomar. If one were to appear within Sherman Associates development is most likely would be the Hotel Monaco brand. Most Kimpton Hotels are branded individually meaning it is not simply called a "Kimpton". Details on what type of hotel or what the potential name could be likely would not be established until the city of Minneapolis recommends a project to move forward in late Summer. Within Sherman Associate's development there also is around 20,000 square feet of space for them to move their company headquarters from across the street at the Old Spaghetti Factory building. Sherman Associates also will begin work soon on their Thresher Square restoration which will be converted into a new hotel. Sherman Associates will also construction a new seven story mixed use building with 175 apartments and 30,000 square feet of retail (which is rumored to include a Trader Joe's). Brent Rogers and his company Saturday Properties LLC is proposing another hotel in a six story building. The hotel would feature 166 rooms and would be branded as an Element by Westin. 10,500 square feet of retail space would be located on the first floor with at least one restaurant located within that space. Designed by BKV Group, another architecture firm that Minneapolis can pride themselves on, the building features a very modern design that reminds us of the new residential project proposed over on 10th and Marquette. The overall project would not stick out as much as the other projects proposed as the height of the building would be comparable to The American Academy of Neurology and the Aloft Hotel located on each side. Element by Westin was launched in 2006 by Starwood Hotels and Resorts is a styled as an extended stay hotel. The brand is is the first hotel of the Starwood Brand that is intended to be environmentally friendly. This means that the hotels are built eco-friendly from the ground up including many recycled materials along with using energy efficient lighting and plumbing fixtures. What proposal do you like best? A soon as we posted our article about Sherman Associates proposal for a nine story hotel at 800 Washington Avenue another proposal was announced by Finance and Commerce. Mortenson Construction is behind the next project proposed for the vacant site. The second proposal for the site includes another 9 story hotel that would be branded as a Hyatt Centric. The hotel is a new concept from the Hyatt brand aimed at the millennial generation along with the business travelers who truly want to experience the city in which they are staying. If you want to know more about the brand visit their website here. We're serious when we say ALL the details are there. There's even a lengthy video explaining just what sets Hyatt Centric apart from the rest. The proposal put forth by Mortenson Construction is for a building that would house 188 hotel rooms, banquet space, and also a local restaurant on the first floor along with additional retail space. Designed by ESG Architects along with Shea Design the structure is very modern and compliments the neighboring structures very well. Minneapolis will select a proposal in late August or September according to Finance and Commerce. Construction could begin in Spring of 2016. It is expected that the rest of the proposals for the site will be released later today or early tomorrow by the City of Minneapolis. We'll have more information on the projects as soon as, well, we can get our hands on it. Until then, go enjoy the nice weather outside. There's been a prime vacant site sitting on Washington Avenue that will soon see a new development rise... The question is what developer will exactly get to develop the site. The City of Minneapolis a few months ago put out a call for development proposals for the site that sits at 800 Washington Avenue South near the Guthrie Theater. It's located directly next to the ALoft Hotel and the new(ish) American Academy for Neurology. Proposals were due yesterday at 4:00pm however one proposal already has made the headlines. The Journal broke the news a few days ago that Sherman Associates is planning a new hotel development on site. Since then multiple news sources have spoke about the development, none stating the plans put fourth by other developers. Sherman Associate's plans include a 9 story building with 140 rooms along with a Pinstripes on the first two floors of the building. Pinstripes is a venue that features a bistro with Italian/American cuisine along with a bowling alley, bocce ball courts, and often an out door patio and fire pit. Currently the company has a one Minnesota location in Edina. Pinstripes currently has seven locations altogether, that includes a recently opened location in Downtown Chicago, and has plans for an additional five more locations in the next two years. What hotel concept would call the building home is yet to be announced. We'll have more information on this project along with the other development proposals for the site by early next week. Plans have surfaced showing more details for the hotel project planned for the corner of Essex Street and Huron Boulevard near the University of Minnesota campus. The project will be developed by CPM Development and could begin construction as soon as next month. The design features a 5 story hotel standing 63 feet tall to be developed on an irregularly shaped site. Underground parking along with surface parking would provide space for 83 vehicles with entry of Huron Blvd. 140 rooms will be included in the project with the first floor including a 3,500 square foot restaurant and also a pool. The second floor would be devoted to meeting space and banquet facilities and along with a covered patio. Originally CPM Development planned to construct a 123 room hotel on the southwest corner of the road on a site that had been home to a few homes that were the property of CPM. Those homes were demolished last fall and the site sat primed for construction for what many believed would start this Spring. However, plans changed as they often do in the world of construction. A deal changer came into play a few months ago when the University of Minnesota purchased the site from CPM in order to have space for future development. CPM still intended to develop a hotel in the area and was able to quickly find a space for the hotel project and purchased a site directly across the street from the former project. The site currently houses the EverFresh Food Corporation which will move and the building will be demolished. The overall design of the project is an immense improvement from the first planned hotel. The lobby will located off of Huron Boulevard while outdoor seating for the restaurant and a pocket park will be located at the corner of Essex and Huron. The building had a bit of a challenge when it came to the design process as the site is quite irregular. The design ended up being heavily influenced by pedestrian areas. Exterior renderings provided by DJR Architecture show a modern design that includes a large use of glass facing the street. The exterior of the building will include dark grey brick, stucco, and metal paneling. CPM Development's project will go before the city planning commission on May 11th. A PROJECT PAGE featuring floor plans and more renderings will be available soon. There's another project that has entered the design phase and could soon be gracing the skyline of Minneapolis. Oh and we should mention that this time around it's one of the biggest yet. Sam Black of the Minneapolis/St. 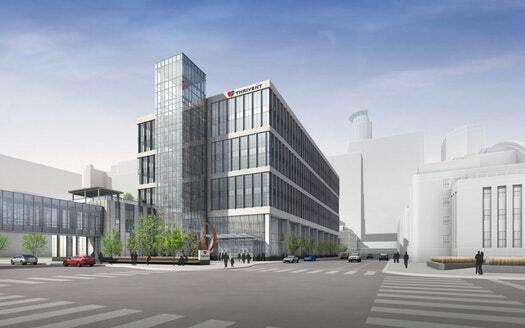 Paul Business Journal reported last week on the plans that Franklin Street Properties is in discussions about for part of the site where TCF Bank currently has their downtown Minneapolis headquarters located. It's been clear for over a year now that redevelopment plans were in store for the sight however those development plans remained unknown. 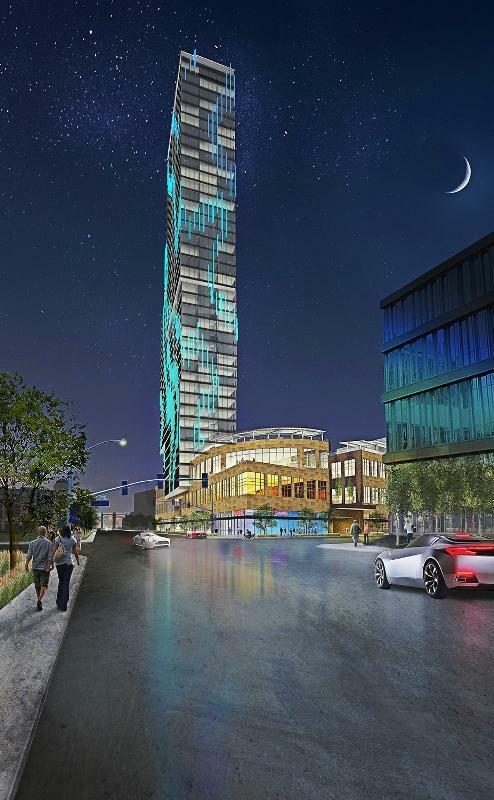 Franklin Street Properties is now including in one of its potential designs a tower of 45 stories. That tower would include a 4 star hotel in the base, about 200,000 square feet of office space in the middle and topping the structure out would be about 150-200 residential units. It would be quite the structure and quite the gain for the core of downtown Minneapolis. Another proposal currently being evaluated by Franklin Street Properties is one that would include strictly just office space of about 200,000 square feet. At the current moment it seems as if the larger proposal is most likely to be the one to move forward in the design phase. Franklin Street Properties is already in discussions with a tenant that would take about 100,000 square feet of the office space, hotel operators are also interested in 250-300 rooms along with multiple residential developers who are interested in the residential aspect of the project. TCF Bank will vacate the corner space in 2016. It is unclear when redevelopment of the project exactly will begin but it is likely to be soon after. Minneapolis has finally spoken about who they are recommending as the developer for the former Nicollet Hotel block in Downtown Minneapolis the MSPBJ reported today. From us here at The Development Tracker we would just like to pat Minneapolis on the back (if that is somehow possible) and say wise choice. If you're unaware of what's going on regarding the Nicollet Hotel block (located at 30 Third South Street) don't worry as we are here to fill you in. Relax in that seat of yours and let your eyes feast on the words below. Minneapolis put a call out last year for development proposals for the block that use to be home to the grand and iconic Nicollet Hotel. Minneapolis was looking for a new development to be constructed on arguably one of Minneapolis' most development primed sites but there was a catch as Minneapolis didn't want just anything built there. The requirement was for a development that was for sure just not going to be another six story residential project. The new development needed to be grand, iconic, and over 20 stories tall. Four groups submitted proposals for the site. Doran Companies submitted plans for a 30 story structure that would include apartments, a hotel, offices, and retail while Mortenson proposed a 31 story structure with 273 apartments. Then there was Duval Development who submitted something truly iconic, an 80 story structure that would stand about 100 feet taller than the IDS building which is currently the state's tallest building. However Duval's proposal was taken out of the running when financially backing could not be proven. The winner of them all was the proposal put forward by United Properties. Called "The Gateway" United Properties proposal includes a 36 story building that will include luxury apartment units, a 183 room Hilton hotel, along with restaurant and retail space on the street level and even the possibility for a charter school along with some office space on the skyway level. Mortenson worked with Duluth based LHB Corp, StaurtCo which currently is responsible for the development of One Southdale Place in Edina, MN, Aimbridge Hospitality, and FRM associates which is based out of Minneapolis. More details will emerge today regarding the project. City officials say United Properties proposed a project with the highest development cost along with the highest purchase price which played a large role in its recommendation of the project. As more details emerge we will be sure have to have them right here at The Development Tracker | Minneapolis.